Complementing her academic roles, Dr. Libby also serves as principal oboe of the Springfield (MO) Symphony Orchestra. In addition to her academic degrees, she also holds certificates from the Banff School of Fine Arts in Canada and the Berlin Hochschule fuer Musik. A 2007 graduate of the International Harp Therapy Program, she is the only Certified Harp Therapy Practitioner in the state of Missouri, and established the first and only course dealing with the healing power of music at MSU. 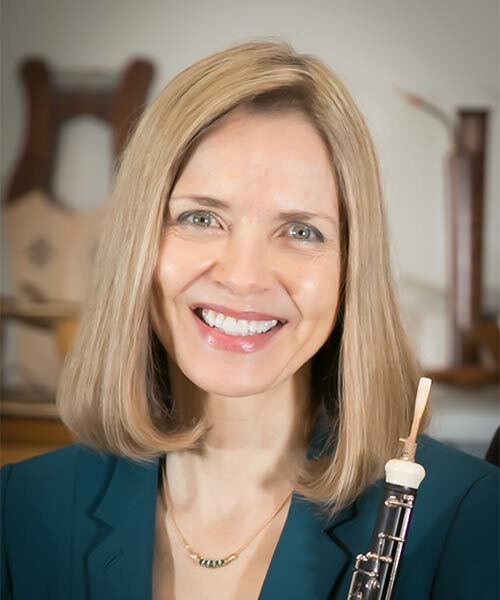 Since the 1980s, she has promoted and premiered numerous works by women internationally; more than twenty oboe pieces have been dedicated to her by Libby Larsen, Joan Tower and others. Libby’s research has been published in Women of Note Quarterly, The International Alliance of Women in Music Journal, The Journal of the International Double Reed Society, Norton/Grove Dictionary of Women Composers, New Grove Dictionary of Music and Musicians, Harp Therapy Journal and others. Libby’s oboe editions and compact discs are available on the Hester Park and MSR Classics labels at www.vivacepress.com and www.msrcd.com. Her MSR release of Harbach’s oboe concerto with the Slovak Radio Symphony was voted “Best Classical Recording of 2008”. In 2014, Audiophile Audition’s reviewer Paul Kennedy gave her most recent CD, The Lotus Pond: Exotic Oboe Sounds the highest rating of 4-stars. The history and performance of music for healing and its impact on empathy development in students.